So a week or so back Billboard hosted a round table of female country artists and the current frustrations they have dealing with country radio's inability to get them on the air. This has been an ugly situation that I've discussed before at length during the height of bro-country, but even now little has changed outside of isolated moments of success, where b- and c-list male acts can snag airplay and festival stages while leaving their female counterparts high and dry. This hit an apex in 2015 with 'Tomato-gate', when radio consultant Keith Hill compared women in country to 'tomatoes in the salad' - and yet a year later outside of isolated moments, little has changed. Kacey Musgraves and Cam both stalled out on the radio despite great singles, and though Maren Morris' 'My Church' was a hit, I don't see that follow-up coming. Then you have Kelsea Ballerini's lack of concern about all of it... well, we'll see if that changes when 'Peter Pan' starts to dry up, and that's speaking from someone who likes that song! And yet that roundtable had an undercurrent of optimism that things were going to get better - and I'd argue they're right, but I wouldn't say any of them were leading the charge. With the exception of fringe indie artists like Dori Freeman who deserve a lot more attention, 2016 has had a slew of strong albums from women, specifically older women like Brandy Clark and Jennifer Nettles who are releasing strong solo projects in their forties. And to add to that mix comes Lori McKenna, a songwriter who has been working behind the scenes for decades but recently received praise for her work behind Little Big Town's 'Girl Crush' and Tim McGraw's 'Humble And Kind'. And yet indie country fans know that she's been releasing critically acclaimed records since 2000 with a distinctive folk-touched vocal tone and the sort of sharply incisive songwriting that isn't afraid to pull punches. She actually did release an album called Unglamorous on Warner Bros in 2007 in the height of a small boom for women in country - and for the record, that record has aged incredibly well and does indeed hold up, but the production was far too slick to match her writing, and I don't have any problem believing it got lost in the crowd. So she went right back to the indie scene where country and folk blended a little more easily and four years later in 2011 dropped a borderline classic with Lorraine - seriously, if you're looking for the three records to get a full picture for Lori McKenna, it's 2004's Bittertown, 2007's Unglamorous, and 2011's Lorraine. Hell, you could argue that the reason her following two records, 2012's Massachusetts and 2014's Numbered Doors, didn't quite leave the same impact is what they had to follow, although in both cases you could make the argument the songwriting didn't quite cut as sharply as the best hits of either record. And yet with the success of 'Girl Crush' and 'Humble And Kind', Lori McKenna now has more momentum than she's had in probably a decade, so she connected with Dave Cobb and put out a new record called The Bird & The Rifle - and yes, I know I'm late to the party here, but I knew after going through her entire discography I had to cover this. So does it live up to my high expectations? Well, yeah, absolutely. 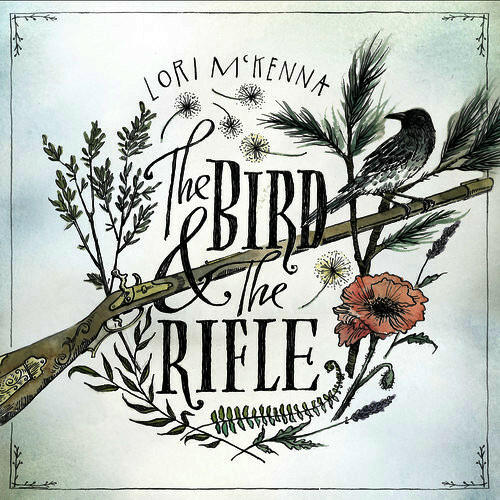 I'm not quite certain Lori McKenna has delivered another classic - ask me again when I finish listening to the album another twenty times - but with The Bird & The Rifle she definitely delivers one of the strongest country records I've heard thus far in 2016. This is a record that got under my skin very early and refused to let go, with the best sort of production in order to match the cutting lyrics that go all the deeper with time. I'm not sure if it's better than Bittertown or Lorraine, but it definitely rises to the challenge, in familiar territory for any Lori McKenna fan but still powerful all the same. arranged instrumentation in the background. And while there are a few tones that I think might have used a shade more bite - a little more depth in the rattling electric tone on 'All These Things', the descending warble on 'Always Want You' - this is nitpicking of the highest proportion. The word of the day here is subtlety - Dave Cobb has always had a fine touch for instrumental dynamics, but this might be one of his most restrained and yet gorgeously organic productions to date, always letting the guitars and piano carry the melody with just enough mellotron or arranged instrumentation to add that burnished accent touch, with the sparse percussion often adding just enough of a beat on muffled cymbals or deeper drums to act as a foundation. Granted, it's not really needed - I really need to highlight how great the basslines are on this record, never obtrusive but thick enough to cushion the sound, make it feel all the more intimate. And make no mistake, the intimacy is quintessential to making these songs work, both through Lori McKenna's delivery - her drawl just enough to command the mix without needing to raise her voice, only a touch ragged because of time - and through the hooks. This album could have soared on much bigger tones - indeed, some critics have commented this album might be a bit too subtle and even-keeled, which I can see even if I disagree this is a drawback - but it doesn't need to, as McKenna is often telling lonely stories, where age has tempered the raw emotion into something quieter, yet no less deeply felt. It's one of the reasons why I'm not bothered that the foundational melodies are fairly straightforward and catchy in their own right - not just because Cobb can flesh them out but because it fits the content all the better. And McKenna brought her A-game here in terms of well-framed lyrics and themes, plenty of which focus on the passage of time and how it changes people. The relationships and lives of these stories have the long-held scars of many unspoken experiences, where there's faint nostalgia but also the feel that some things may have been broken since the start. The opening track 'Wreck You' is a gutpunch as she doesn't quite know who changed in the relationship, but she can see it fading away, and to follow it with the lost dreams and awkward love of the title track is a hell of a way to open the album. And I've always loved McKenna's framing: there's no obvious villain or broad caricature, just humans facing the onset of entropy and decay as time carries on. Even the ghosts of the small where she grew up are leaving on 'Giving Up On Your Hometown', where attempted gentrification has sputtered out and she tries to spend more time recapturing whatever light left behind than the losses the past. It plays out in a similar way on 'We Were Cool', a wonderfully detailed small town romance that takes a turn for the complicated when she gets pregnant and sees her dreams fade as her friends go off to school and she's left with her husband in the small town, reflecting on an image of cool that's blurring away. And it becomes all the more stark on 'Old Men Young Women', a song where you could easily paint the girls as gold diggers or the guys as predators, but instead you get a surprisingly nuanced picture of human naivete and a desperation to capture or recapture something slipping away, be it memories of youth or a man who knows how to treat a woman right. That takes us to 'Humble And Kind'... and look, I like Tim McGraw's cover and how much it feels like one voice echoing out of a mainstream country scene where he's the exception not the rule, but McKenna normalizes the framing in a way that I find wonderfully charming. But of course, as much as we all aspire to goodness this album doesn't shy away from human failings either. The album closer 'If Whiskey Were A Woman' is a prime example - she can't be the person that'll give this guy solace or comfort or return his love, so she gives up to walk away, even as she knows he'll be using the ideal of her to keep on searching. And then there's the utterly heartbreaking 'Halfway Home', telling the story of a woman driving home in the middle of the night from a one night stand, trying not to question her own value as she knows she shouldn't have to do this if the guy was worth it and that she just needs to hold on, all the more conscious of how these guys aren't going to be the savior of her or any other woman. And that's a revelation that comes tied to wisdom and maturity that tempers this record, holding to the core of one's internal value... which is where I've got issues with two songs near the end of this record, 'All These Things' and 'Always Want You'. It's not like either song is bad - they fit thematically, especially as time passes on 'Always Want You' as she tries to move past a broken relationship - but they don't quite match the same age as the rest of the writing, a little too simple, a little too straightforward to match the rest of the framing. But again, that's a minor nitpick on an absolutely stunning record. Again, I'm not sure where I'd placed this album in comparison with Lorraine or Bittertown - the ending of Lorraine is damn near impossible to top in terms of gutpunch moments in country - but Lori McKenna is staking her claim as one of the best women working in the genre with easily one of the best records of 2016, period. For me, this is a 9/10 and the highest of my recommendations, especially if you're looking for a subtle and yet powerful listen, continuing the winning streaks of producer and artist alike. And if this partnership continues going forward, I can't wait to hear more.